On the 9th December, 2002 following a short illness we discovered that Abbie our 21 month old daughter had a tumour in her abdomen which was thought to be a Wilms tumour. On 17th December 2002 she went to St Georges hospital as an outpatient for a biopsy of the tumour. During the procedure she was found to be bleeding into the tumour and a decision was made to remove the tumour along with her left kidney and adrenal gland. Abbie spent several days in intensive care at St Georges hospital and was released just a few days before Christmas and on Christmas Eve she was given her first dose of chemotherapy drugs. The results of the biopsy of her tumour were very disappointing. The tumour was much worse than we could have ever expected as it was actually an adrenal neuroblastoma which is a more life threatening cancer than Wilms. Also Abbie had NMYC amplification (meaning the cancer is aggressive with the cells dividing up to 200 times more quickly than normal). We were very hopeful that we had caught it early and that any residual following the operation would disappear on its own accord. Not good news we're afraid. Abbie has had a brilliant few months - nursery, holidays, swimming, playgrounds etc. She has been regularly monitored and in June her blood pressure went up and various tests began to indicate that the cancer had returned. The Marsden booked her in for an MIBG scan, (which uses a radioactive substance which attaches itself to these particular cancer cells), which she had a week ago. Lying still for almost 60 minutes with a large scanner plate just a cm or so above your body whilst 5, 10 minute pictures are taken isn't easy for anyone at the best of times but she was an absolute star and with the assistance of a very long Postman Pat video, she did it. At the weekend Abbie started limping and developed a droopy eyelid. Her appetite also rapidly diminished - all symptoms of the return of her condition. Today we received the results of the MIBG scan. This shows the cancer is back and has spread to her bones and bone marrow. This spread means that she has been put on a very intensive course of chemotherapy for seventy days, followed by an operation to remove a secondary abdominal tumour, stem cell removal, high dose chemotherapy, stem cell rescue, radiotherapy and the 6 months of follow up drugs. Looking at the positives our consultant told us she has treated much worse cases than Abbie’s that have survived. She is fit and healthy, (which makes this whole thing even more unbelievable) and only on Saturday morning was running around the garden at a rate of knots being Abbie! She has an amazing immune system, (her cancer is the only illness she has had in the last year) and a strong personality. Treatment of high risk neuroblastomas such as Abbie's has progressed a lot in the last few years and whilst the survival rate isn't as good as for some other cancers the new procedures are starting to impact the results. We are lucky to be just half an hour from the Marsden hospital in Sutton where she will be treated which is one of the World's leading cancer hospitals. So it's not been a good week!!! In the last couple of weeks Abbie has had a Hickman line inserted into her chest; bone and bone marrow samples taken, a CT scan and has had three doses of chemo with the fourth due to start next Sunday. Abbie is surprisingly well, the chemo to date has not had particularly adverse effects. The first dose did cause sickness and as a result of the chemo her blood platelet count dropped. She began to bleed from her Hickman line and as the blood would not clot she required a platelet and blood transfusion at the Royal Surrey. She then developed a mild allergic reaction to the platelets and as her white blood cell count is very low, (in medical speak she is neutropenic and cannot fight infection) she developed a temperature which had to be treated with a 6 hourly dose of intravenous antibiotics. This meant we had to sleep at the Royal Surrey for 4 nights but fortunately were allowed out between doses. As soon as she was discharged we drove to the Marsden for two nights of chemo. Abbie has also had a CT scan under a general anaesthetic. This shows a tumour of approx 5cm x 7cm has grown back in the site of the original tumour - an ultrasound at the end of May had shown nothing at all so it shows how quickly this stuff attacks. This news is disappointing as she may require more surgery to remove it, but is fairly inconsequential in the scheme of things. She is still Adrenal Neuroblastoma Stage 4, (the most severely spread) and N-MYC positive, (the most aggressive type) so things can't get any worse. The potassium levels in Abbie's blood are now very low, so she requires medicine to boost them. She has been prescribed huge doses of the most foul tasting stuff which she refuses to take. Forcing medicine on a two year old is very distressing in such large quantities. We just can't understand why all children's medicine is not chocolate flavoured. This has meant two trips to the Royal Surrey just to collect prescriptions and many inventive ways of trying to disguise it in her food. On a very positive note Abbie's limp has gone and her eye has improved. She looks very fit and healthy - you really wouldn't think anything was wrong. She is eating reasonably well, drinking lots of milk and has minimal weight loss. Most of her hair disappeared very rapidly last week but neither she, Jamie nor her friends have batted an eyelid. She appears to need less sleep and no longer has a daytime nap. Last week I took her to a friends where she had a good old bounce on a trampoline, went for a picnic at Painshill Park and had tea at a neighbours. As Abbie's prognosis is relatively poor we are contemplating having her treated in New York. There is one hospital which has had better results in treating Neuroblastoma patients using antibodies from mice with the aim of teaching the body to fight Neuroblastoma cells itself. In fact the treatment was featured on Trevor McDonald's programme in June. We have asked her consultant to look into this for us and will keep you posted. Abbie completed day 70 or the 8th course of her intensive chemo at the end of September. She's coped pretty well with the intensive chemo with minimal side effects apart from getting a number of temperatures due to her low blood count which has led to many more nights in hospital than we would have liked. (43 nights out of 73) including 2am visits to the Royal Surrey. Over the last week or so she has been undergoing a number of tests to see how well she has responded. Thankfully the news is pretty good. The tumour has completely disappeared and was not detectable on the CT scan, her bone marrow appears to be clear but there was a small amount of disease detected at the site of the tumour in her abdomen by the MIBG scan, (radioactive iodine that attaches to Neuroblastoma cells) and in the bone sample taken from her left hip. We are hopeful that this should all be taken care of by the treatment still to come. Abbie is in fact unique at the Marsden as the only Stage 4 Neuroblastoma case where the tumour has completely disappeared at this stage. This probably has a lot to do with the fact that her primary tumour was removed in December and she was being closely monitored following the initial occurrence but is still an indication of how well she has done. Abbie has just spent another few days at the Marsden having her stem cells 'harvested' from her blood. Next week she goes into St Georges, Tooting for a few days to be 'opened up' to check for any tumour remnants - despite the tumour having gone they want to double check visually that there is nothing left behind. Once she has recovered from the surgery she will start the high dose chemotherapy. Although this only takes a few days to administer it is very strong and destroys at lot of the function of her bone marrow so following this they re-introduce her stem cells to help her recover and kick her system back into life. This means she will be in hospital for at least 6-8 weeks to allow for the treatment, all the side effects, (which are much nastier this time due to the higher doses) and for normality to return to her blood. There then follows 2 weeks of radiotherapy. Following this we have decided to proceed with an antibody therapy that is only currently available in one hospital in the States - the idea is that your body is taught to fight neuroblastoma cells. Our consultant is just initiating contact with the hospital but it sounds as if they will be happy to accept Abbie. Will let you know when we have more news. It's a long old process but it's been nice to see some of the old Abbie return in the last few days. Abbie started high dose chemotherapy at midday on Friday. She now has a gastro feeding tube inserted through her nose which is used mainly to administer her drugs but is also used for having overnight feeds to bulk her up. Despite the fact that the tubes can stay in for 1 month, hers have already come out three times. Putting them in is a very unpleasant experience. The first high dose drug she received is Busulphan and she has had sixteen doses of this through her tube. It's so toxic that the nurses have to gown up to crush the tablet and everyone has to leave the room during preparation in case any is inhaled. So far Abbie has not been too badly affected apart from sickness. Tomorrow she begins the second drug Melpahalan which is an hours infusion through her Hickman line or wiggly as she calls it. Then on Friday her stem cells will be reintroduced to assist her recovery. She is expected to get mucositus within 7-10 days which is basically inflammation of the entire digestive tract. We discovered on Thursday that Abbie's hearing has been badly affected by one of the previous chemo drugs and she has permanently lost her high pitch hearing. It was very shocking as her hearing was perfect in July and we had no idea that her hearing had suffered. She has been fitted for hearing aids at the Royal Surrey, but since then we have been told that it is unusual for children who lose their high pitch sounds to be fitted with aids. 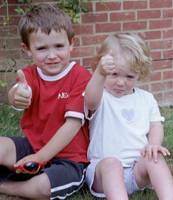 It is exactly a year today that Abbie was diagnosed with a tumour. We are pleased to say that she has virtually made a full recovery from her high dose chemo and stem cell transplant and has been allowed home for the last few afternoons. I am hoping that she will be fully discharged on Thursday morning which marks 6 weeks since she was admitted for the stem cell transplant and her 93rd night in hospital over the year. She has also had 13 blood transfusions and 16 platelet transfusions and by the end of treatment in Feb will have had over 20 general anaesthetics. Abbie tolerated the high dose chemo surprisingly well. The first side effect to kick in about a week after the chemo was mucositis - her gut had been stripped by the chemo and she had a few weeks of stuff regularly coming out of both ends in an array of colours. Amazingly her mouth did not ulcerate, (which normally happens and causes a lot of pain and discomfort), but she did get the most appalling nappy rash. Then three weeks after being admitted just as she was beginning to eat and get back to normal, her liver function began to show abnormal results and her weight and girth measurement increased showing signs of one of the nastiest side effects of the chemo - veno occlusive disease, (VOD). This occurs when the liver gets bunged up and therefore can't operate properly. In most cases restricted fluids help the liver get better of its own accord but in extreme cases it is life threatening. Over a 5 day period Abbie's girth measurement increased by 4 inches and her weight by over a kilo - she turned into a little barrel and was very uncomfortable due to the enlarged liver and the fluid that was building up inside her. Thankfully over the last week her body has returned to normality. After a great deal of research and consultation with the UK's neuroblastoma experts we have decided to hold off taking Abbie to New York for antibody treatment for the time being. Abbie has responded incredibly well to her treatment to date and, assuming the high dose chemotherapy and the radiotherapy work as expected, the antibody therapy would appear to offer little in the way of increasing her chances. We have been told that her response has been one of the best out of all the patients in the last couple of years and that her chances are now 50/50. Obviously there are no guarantees. It is heart breaking to meet the parents whose children are not responding well to treatment when the inevitable lays ahead for them. I just don't know how they begin to cope. In herself Abbie has regained her sense of humour and is amazingly cheerful, she is beginning to eat small amounts of solid food and spends a couple of hours each day running riot around the ward. 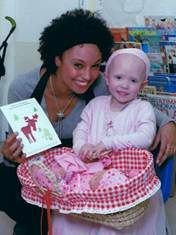 On the 20th January Abbie starts 14 doses of radiotherapy, with each one under a general anaesthetic. The radiotherapy will lose her an inch in her total height as some of her vertebrae will be hit. On the 6th February she will have completed the bulk of her treatment and will take '13-cis retinoic acid' orally for the last 6 months of her treatment. In the next few weeks we are getting Abbie's left eye checked as we suspected it may have been diseased although it seems ok now, and a second opinion on Abbie’s hearing to see whether she actually need hearing aids. We are all really looking forward to having a normal Christmas. Abbie was finally discharged from hospital on 11th December. Thankfully, she recovered from the mild VOD, (liver problems) but unfortunately required a daily injection into her thigh to ensure her blood clotted correctly, (a consequence of the VOD). The last injection was on Boxing day and we were amazed that the community nurses volunteered to visit her on Christmas day and Boxing day so we didn’t have to go to hospital. Despite having 2 Hickman lines, a Portacath and a feeding tube to access her little body she still had to have this particular drug via an injection - unbelievable. In early January we received a call from the paediatric radiotherapy consultant at the Marsden to say that Abbie's radiotherapy had been brought forward to 12th January. This was great news but we then sadly discovered that a space had been freed up, as Naomi, a four year old Neuroblastoma patient that we knew very well had passed away on New Years Day. For 14 days, Abbie received a quick dose of radiotherapy under a general anaesthetic. We thought that the gradual build up of anaesthetic combined with the radiotherapy would make her tired and sick but she tolerated the radiotherapy very well, although her appetite has been knocked again. Interspersed with the radiotherapy have also been a number of tests and scans to re-stage her. Thankfully the results, (some of which can take an agonising 2 weeks to come through), are the best we could possibly hope for - a CT scan showed no sign of the tumour, an MIBG scan showed no presence of neuroblastoma anywhere in her body, her urine which can reveal the presence of this particular cancer was normal and both her bone marrow and bone samples were clear. She is therefore now in complete remission. Last Friday Abbie went up to the Marsden to have her Hickman lines removed so that marks the end of the heavyweight treatment. For the next 6 months she will take an oral drug but that is a joy compared to everything else she's had to take. Remarkably she is the same weight now as she was when she relapsed but her appetite has taken a knock so she is still on an overnight feed, (which goes down her nasal gastro tube), for the next few weeks. This does however make administering her medicines a piece of cake - every child should have one! Finally on Monday she had her hearing re-checked - it is now thought that Abbie does not require hearing aids, but she has lost a lot of her high frequency hearing, (above 3kHz for the technically minded), so we need to keep a watch on any effect this has on her development. She spent a few afternoon sessions back at nursery during the Radiotherapy and is now attending 4 mornings a week as life thankfully starts returning to normal. There has been a noticeable change in her personality in the last few days as she begins to enjoy life again. We are now planning some holidays and hope to be able to have a social life again! Abbie has done really well since our last update. She has just finished her 3rd round, (of a total of 6), of Retinoic Acid, a vitamin A derivative, the purpose of which is to kill off any remaining or newly growing Neuroblastoma cells. This treatment, whilst so simple and straightforward compared to everything to date, has improved the survival statistics by 10-15% in the last 10 years. The capsules, (which we pierce open and mix the contents with fromage frais), are actually the most powerful acne treatment around and the dose prescribed for Abbie is extremely high. As you can imagine as we reach the of each 14 day course her skin is extremely dry and blistered around her mouth but it recovers quickly and it doesn't seem to bother her. Abbie's high pitch hearing loss does appear to be permanent but does not seem to be affecting her too much. At the moment we have decided against having digital hearing aids fitted but will ensure that her progress is regularly monitored. Abbie has now returned to nursery for four mornings a week and is thriving. She had her celebrated her 3rd birthday on 1st March and had a great time at her party with lots of her friends in attendance. Her hair is growing back well, (slightly darker than before) and her fitness and appetite returning. We have also managed to squeeze in a couple of holidays which both Jamie & Abbie thoroughly enjoyed. As Christmas approaches Abbie is on wonderful form. She is an active and very keen member of Glenesk Kindergarten. She has been selected to be a cow in the school nativity play although she is a little disappointed that she’s not a donkey. She is now learning to read and can already write her name which was completely self taught - not bad for a 3 year old. Abbie now attends swimming, dancing and gymnastics which she is really enthusiastic about. Her hair has now completely grown back and is a mass of brown curls rather than the blonde wavy hair she had before. December marks two years since Abbie was first diagnosed. Although that time has gone enormously quickly it seems like another life time ago. We are still attending the Marsden regularly but at the moment everything seems to be OK. Some of you will know that for the past three months, Abbie has had her leg in plaster. On the 21st March following a routine check up at the Marsden where she was given a completely clean bill of health Abbie attended a party at a soft play area. By the evening she was limping. I telephoned her consultant the next morning who said she was in fantastic health and it was probably nothing to worry about but as we were due to go to on holiday to South Africa I decided to take Abbie to casualty. Despite being referred up to the children’s ward and several doctors examining her she was given a clean bill of health but due to her previous medical history she was given a urine test which came back a few weeks later as completely clear. The limping however continued and when we arrived back from holiday she was x rayed and it was found that she had a tibia stress fracture. Abbie was put in plaster for 2 weeks but after the plaster was removed it was obviously not right and was put back into plaster a few weeks later. After another few weeks her leg x rays looked worse which we felt was because the initial plaster was removed too quickly, and her treatment had been mismanaged, however she was also referred to a pediatrician at the Royal Surrey. On examination he discovered a small lump in her bowel which he believed was constipation so Abbie was put on Lactulose for a week or so. Another urine test was done and we were also referred back to the Marsden. At the Marsden they x rayed her leg and gave her an ultrasound but saw no significant signs of relapse but initiated another urine test. Unfortunately the results from this test indicated her cancer was back and we were told on 22nd June that it was extremely likely that she had relapsed. Mike and myself have been in total disbelief because Abbie has been so incredibly well and had displayed none of the relapse signs that we have encountered before. Abbie spent last week having more tests - a bone and bone marrow biopsy, a CT scan and a MIBG scan. A blood test last week revealed she had low platelets which was a poor sign and at lunchtime today after two incredibly tearful and stressful weeks, Mike and myself received final confirmation that Abbie’s cancer has extensively returned spreading to her leg and bone marrow. 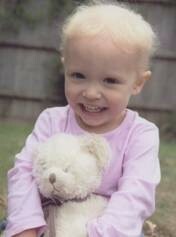 There is also Neuroblastoma disease within an enlarged lymph node (4cms) near her left groin. This afternoon, Mike and myself have been to the Marsden to discuss treatment options with her consultant. As Abbie has relapsed her prognosis is very poor. There are very few children who relapse from Neuroblastoma having had the treatment that Abbie has already received and have survived. We visited the Marsden not knowing if they could offer us any further hope or treatment. Fortunately as she has been off chemotherapy for 21 months there is still a chemotherapy option available to us which gives us a slim hope that we may still be able to save Abbie’s life. It means Abbie will need another Hickman line inserted and entails seven days of treatment every month for 4 months, with 2 nights out of the 7 in hospital. She will lose her hair again and will have to endure the same kind of side effects that she has suffered from in the past. If the chemotherapy works we may also be eligible to start a trial for an Antibody which may teach Abbie to fight the cancer herself. We feel that this is her best option for fighting this awful disease. The antibody is a similar treatment to the one we considered taking Abbie to the States to receive last year. It is so new to the UK that the trial will only be available from the Autumn. We are lucky that treatment options available have already vastly improved in the years since she was first diagnosed with this cancer. On the downside if Abbie does not respond to the treatment initially, she will be taken off chemotherapy and given lower dose care to give her the best quality of life but it will only prolong her life for as long as possible. Abbie will also receive radiotherapy to her leg as soon as possible so that the fracture begins to heal and hopefully she will be able to come out of plaster before the initial chemotherapy commences. Despite the news today being disappointing it was expected and has put us out of misery. We are now looking forward to the treatment beginning and despite there being a slim chance that it will work has at least offered us a glimmer of hope in a very dark tunnel. We are also thankful that we have had 18 fantastic months to enjoy Abbie. 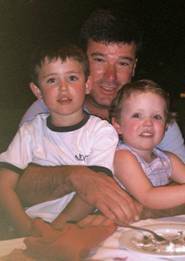 Other parents we know were not so lucky and never managed to achieve remission first time round. This will be our third attempt. In light of Abbie’s relapse Mike and myself have decided to have both Jamie and Abbie christened at St Martin‘s church in East Horsley. This has been provisionally booked for 17th July at 12.30. This will go ahead if it does not interfere with her treatment plan. We are hoping that will be a really happy event - a celebration of both their lives. To avoid it becoming to overwhelming for them we will be inviting close family and Jamie and Abbie’s friends and their parents. A lot has been happening in the last couple of weeks - so here's as brief a summary as possible of her treatment. Following our meeting with Abbie's consultant on 4th July we had to wait a whole week before treatment started. Saturday 9th July a canular was inserted into her arm and bloods taken from it. Sunday 10th July - Due to a lab error Abbie had to have more blood taken for a blood cross match. The canular would not work so she had to be pricked again. Later in the day she had a blood transfusion through the canular at the Royal Surrey which took seven hours as she had a simmering temperature. Monday 11th July - Echogram at the Marsden to check her heart can cope with more chemo. Another prick and another blood test because the Royal Surrey forgot to check her blood clotting on Sunday. Blood had to be squeezed out of her arm because they could not get an adequate sample. How upset and angry was Abbie and how furious was I at this point! She then received a platelet transfusion at the Marsden followed by an operation to insert a Hickman line at St Georges. Abbie was so distressed that she went into shock and was sick on the way to St Georges. She then developed a temperature and it was touch and go as to whether she could have the op. Also St Georges tried to cancel the operation as they were running late but luckily the surgeon insisted that they go ahead when her temperature came down. Tuesday 12th July - Radiotherapy planning ( On arrival I am told they need to tattoo her leg with 4 pricks). Fortunately because Abbie is so upset they decide to use pen marks instead. A last minute radiotherapy slot becomes available so Mike dashes down to the Marsden to help calm Abbie down. Wednesday 13th to Friday 15th July - daily radiotherapy on her leg - Abbie has to lie still on her own in the radiotherapy suite for 2 x 2 minute periods whilst her leg is irradiated. We are able to see her on video camera and talk to her via microphone. Monday 18th July - final radiotherapy session to leg, a platelet transfusion, her first chemotherapy of Topotecan and a ultra sound of her leg to check for blood clots. Tuesday 19th July - Visit to Royal Surrey to get her leg put back in plaster then straight to the Marsden for her second dose of Topotecan plus a blood transfusion. Friday 22nd - Admitted to the Marsden for 2 nights for her fifth Topotecan plus a 48 hour infusion of two other chemo drugs. We arrive at 9.15am and are told there are no beds available. Also her Topotecan has not been dispensed so we have to wait until 2.30pm before anything happens. The doctor who saw Abbie on Friday neglected to take bloods and so on Saturday when a blood test is done everyone is shocked to realise that her HB has fallen to 5.8 and her platelets are only 5. I don't ever remember her blood count being this low before. Abbie is also now Neutropenic which means she can no longer fight infection. Her low blood count means that Abbie had a blood and platelet transfusion on Saturday and a further blood transfusion on Sunday. On the positive side Saturday night was the first time in about 2 weeks that she did not get a temperature at night. Given that the Neuroblastoma has probably been causing the temperatures this is a good sign. Also we had been told that we would have to take her straight form the Marsden to Royal Surrey to start antibiotics as she is neutropenic and febrile but luckily as she didn't spike last night we are now at home. Abbie has been very traumatised by the treatment and last week we felt she was beginning to go downhill. She had been excessively tired and withdrew into herself with her sparkle well and truly gone. Last weekend some large bruises appeared on her left leg and thigh - these were partly due to her low platelet levels, the cancer has also been progressively kicking in with her left eye drooping slightly, night sweats, temperatures and constant nagging pain, particularly at night which has prevented her and us sleeping well. On Sunday she seemed to hit rock bottom and hardly moved all day and completely stopped eating. Over the last couple of weeks her left thigh has been swelling up and it was decided on Monday she should have an ultrasound to check there wasn't a blood clot. It has turned out to be another enlarged lymph node in her leg so yet another sign of the cancer. The last four days have been much more positive - she is eating small amounts has been more cheerful and now needs very little in the way of pain relief. Her leg is back in plaster following the radiotherapy and she is delighted with the luminous pink plaster the Royal Surrey ordered especially for her! She spent Wednesday afternoon at a party on very good form and on Thursday afternoon spent 2 hours at Holiday Club at Glenesk. Mr. Bishop tells me that she was the perkiest he has seen her for some time so hopefully that means the chemo is working. We have now completed this cycle of chemo and need to wait until her blood counts recover before repeating the chemo cycle in about 3 weeks time. We are hoping that the chemo will begin to work and reduce the enlarged lymph nodes. If her leg improves we know that the chemo is probably working. We have arranged a meeting with Andy Pearson on Wednesday morning. He is now head of the children's dept at the Marsden in Sutton and is also the UK's leading neuroblastoma expert and probably the leading expert in Europe. I briefly met him on Friday without Mike and he tells me that Abbie is the first relapsed neuroblastoma patient at the Marsden to be offered these phase 2 trial drugs and probably the first child in the UK. We did not know until last Tuesday that the radiotherapy and chemo could not be given together so we cancelled Abbie & Jamie's christening last week thinking that we would be on the ward. We have now postponed it until 14th August. In actual fact it was just as well as Abbie was so poorly last Sunday. I am really hoping that by 14th August her leg might even be out of plaster. Finally Claire Attard and other friends are organising a big Fund Raising Event for Neuroblastoma Research on 21st September, so if you live locally please keep it free. Details to follow soon. Thanks for all the letters, cards, texts, e mails etc etc. We really appreciate having such fantastic support from our friends. Abbie completed her first round of chemo on Sunday 24th July. On the following Tuesday we went to the Marsden for a GCSF injection which she is given daily to help her blood count recover after chemo. While we were there Abbie spiked a temperature and we ended up staying a week at the Marsden and were then transferred to the Royal Surrey for 2 nights. Abbie had a staphylococcus line infection which meant she had to have IV antibiotics 4 times a day for 2 weeks. After being released from the Royal Surrey we have had a fantastic fortnight. Abbie has been very well - no temperatures, no pain, eating well and enjoying life. Jamie and Abbie had their christening last Sunday and Abbie was on great form. The following day she began her second round of chemo and on Friday was admitted for her 48 hour infusion. Unbelievably she was positively looking forward to sleeping over at the Marsden. We were discharged this afternoon. Things were all a bit grim at the end of last month. We saw Prof Pearson the European neuroblastoma guru at the Marsden a few weeks ago. He told us that there are no cases of relapsed MYCN positive (the aggressive type of neuroblastoma which Abbie has) children surviving long term and that we need a miracle to save her. This news combined with the fact that Abbie was quite unwell and miserable made Mike and me feel quite depressed about her condition. On the positive side Prof Pearson did say we were in the best place for a miracle to happen. The general feeling is that because she has relapsed after so much treatment already it is likely that even if she went back into remission she will relapse again. There are however new treatments that we can try to help prevent Abbie relapsing again including a radioactive bullet to target neuroblastoma cells and also the antibody treatment we've mentioned before. We already know that the chemo is beginning to work. Her leg swelling, (due to an enlarged lymph node), is now completely normal, the swollen lymph node in her groin seems to have gone and she is beginning to put weight on her broken leg. In fact she took a few steps tonight. She is in very good spirits, she is eating really well and since her christening has had her nasal gastro tube removed. This round of chemo has barely affected her - no sickness yet, no mucositus, (last time she bled from the mouth) and most importantly her blood counts are pretty good despite having had a week of chemo. Her last blood transfusion was over a week ago. This indicates that her bone marrow is working quite well. On 1st , 2nd , and 5th September Abbie will have bone and bone marrow taken, a MIBG scan and a CT scan to see how much the cancer has regressed. Fingers crossed that her bone marrow will be clear. That is the best possible result we could hope for. Will let you know when we have more news. As you may be aware Abbie has recently had two scans and bone and bone marrow taken to see how she is progressing. The results of the CT scan showed a good partial response. The MIBG scan also shows considerable reduction of disease. There is still disease in both of her tibia's and her left thigh and groin but this is only residual. When they took bone on Monday they were only able to extract it from one side of her back. We do not have the result yet but we would not expect the bone trephine to be clear yet. The results of the bone marrow (aspirate) are that it is now clear. This is a fantastic result especially so early on in treatment, although we are aware that she also achieved an outstanding response two years ago and still relapsed. Having a clear bone marrow does however open up other avenues of treatment and technically it would be possible for her to have a second stem cell transplant if required. We are meeting Abbie's consultant next week to discuss every possible treatment we can give her to prevent her relapsing again should we get her back into full remission. Abbie in herself is on fantastic form. She did get a temperature after her last round of chemo which meant us staying in hospital all over the bank holiday and overnight for a further couple of days. We have resigned ourselves to the fact that an unusual side effect of chemo for Abbie is getting a temperature and therefore being put on IV antibiotics. Since then she has recovered in leaps and bounds and has the most amazing appetite at the moment. Over the bank holiday the physio at the Royal Surrey suggested her using a walking frame to get her back on her feet. Abbie is very proud of her zimmer frame which we painted pink and put a Barbie bell on. She took her first few independent steps a week later and since then has started standing and walking more and more. Today Abbie went back to school for her first morning in Reception. Round three of chemo starts on Monday and we are hoping she should be able to attend school every morning next week and have chemo in the afternoons. We are also hoping that her plaster will be removed on 21st September. This would be a fantastic psychological boost for Abbie. Her leg went into plaster on 7th April and frankly she is fed up. Since we last e mailed Abbie's leg has been taken out of plaster. Her leg is slightly deformed and she walks with a limp but it's possible that as she grows the deformity will even itself out and become normal. We also received the results of the bone trephine (you may remember we did not expect it to be clear). Amazingly it was clear - we were delighted as her response would appear to be better after two rounds of chemo than her intensive treatment two years ago. Surprisingly even though Abbie's response has been the best we could possibly hope for, her long term prognosis remains poor as Neuroblastoma has a habit of returning. We still live in hope and the fact that she is still being treated and responding is a good sign. Abbie returned to school in September and has only missed four mornings so far this term which is truly amazing all things considered. As Abbie's bone marrow was clear we have decided to pursue higher dose treatment, namely MIBG radioactivity and Topotecan with stem cell rescue. This week Abbie has been having a stem cell harvest. This entails having a vasocath inserted into her groin under a general anaesthetic and stem cells harvested from her blood over a period of a few days which are then frozen for future use. The harvest was completed quicker than expected and we were released yesterday. Abbie is now due to have a fourth round of TVD chemo and will have further scans on 8th and 9th November. The best result we could hope for is that they are now completely clear or MIBG negative. The following day we are taking Jamie & Abbie to Euro Disney for a few days. We are now looking at early January to commence the MIBG radioactive treatment and this should be complete by mid February. In between now and then she will have a fifth round of TVD chemo. Finally, just to let you know that the Autumn Event was an amazing success with over £52,000 raised with another £20,000 donated from a charity fund at the Brompton Hospital. There is also money pouring in from donations, a fashion show, bike ride, marathon and coffee morning. Mike had a meeting with Andy Pearson (the fountain of Neuroblastoma knowledge) on Tuesday and has brought to his attention a new drug which is being developed by a Canadian company called Pharmagap. Pharmagap are going to be invited to present their findings to a meeting of Neuroblastoma experts and we are hoping that the money in Abbie's Fund may be used to fund further research. Thank you to everyone involved in raising money or attending events for Abbie's Fund - who knows we could be close to helping to fund and find a cure for this dreadful disease. Last week Abbie had a CT scan and an MIBG scan. Fortunately, as she is now clear of disease in her bone and bone marrow it is not necessary to do the bone trephine and aspirate tests. The results of the CT scan showed that the lymph node in her groin on the left side has continued to reduce in size but may still be slightly enlarged. The MIBG scan also shows some evidence of existing disease in her left groin and also existing disease in her left upper tibia or knee. We are reasonably pleased with these results - she is continuing to respond to the TVD chemo, and has so far showed a very good partial response. We are getting close to her having a completely clear scan. Abbie will start a fifth and final round of the TVD chemo on 21st November for a week and then she will be free to enjoy Xmas and the New Year until 9th January when she will commence the high dose MIBG radioactive treatment. This will be administered over two periods in January and she should be allowed out between 17th-23 January. Her stem cells will be thawed out on the 1st February and reintroduced to her blood stream on 2nd February. She will then remain in hospital for a further three weeks or so to ensure her full recovery. We are hoping she will be out by 22nd February. It is her fifth birthday on 1st March so with a bit of luck she will be on fine form and back at school for that. 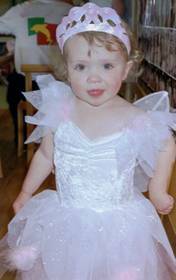 We do not have any news of the antibody trial yet but we think Abbie can get three doses as part of a phase 1 trial on compassionate grounds over a period of three months. In the last few days we have taken Abbie and Jamie to Disneyland. Abbie was given VIP status which meant we never queued for a ride, were always given the best seats, were allowed to stay on the rides for more than one go, met the cast of the Lion King and best of all every Disney character made a huge fuss of her. They both had a fantastic time and its a memory we hope they will both have until their old age. Sorry we have not sent an update for ages but we have had no definite news so this one is a little long. Abbie completed her fifth round of the TVD chemo back in November. Unfortunately in early December she tripped and broke her leg again in the same place and so is now back in plaster. The following day she developed another temperature which was related to a previous line infection and so was put on very strong IV antibiotics four times per day which meant overnight stays at the Royal Surrey for two weeks. Fortunately the line infection cleared - we were told if it had not cleared she would have had to have had an operation to remove her Hickman line and a further operation to have it replaced. Abbie also had another scan just before Xmas which showed that the disease in her knee and groin had not changed since the fourth round of chemo. Xmas was great and Abbie was the picture of health. On 10th January Abbie was admitted to the Marsden to start the first round of the double MIBG/Topotecan. Originally we were told that a child as young as Abbie would need to be sedated for the treatment however it was then decided that she would cope OK. Abbie was injected with a very high dose of radioactivity on 11th January and put in an lead lined room. For five days Mike and myself had to gown up and carry a Geiger counter every time we entered the room. The most stressful day was the first day when I clocked up well over the daily limit on the counter mainly because I couldn't get her web cam or DVD player to work. After that the radioactivity drastically reduced. Abbie tolerated the treatment exceptionally well and was allowed home the following Saturday. Jamie had to stay away from home until Tuesday to ensure it was safe for him to have contact with her. Abbie had a series of scans last week. The first one showed enormous take up of radioactivity in her left leg - Mike realised that this was her plaster cast which had become more radioactive than Abbie. Her scan on Monday looked completely clear but these scans are not diagnostic scans so it is hard to say whether Abbie is in remission. If she is not in remission she is very close. Mike also had a meeting with Andy Pearson the UK Neuroblastoma expert last Tuesday. He feels that it would be wrong to give Abbie the antibody as there is not sufficient evidence to suggest it works. Mike and me have deliberated on this point for a long time and have finally come around to thinking that he is right. Limited results to date suggest the treatment does not offer any advantage but in another few years it may have been developed further. Abbie will however receive a new protocol of Retinoic Acid. This is the high dose Vitamin A acne treatment she took before for 6 months. This time she will take it for 12 months and hopefully this time we will be able to give her capsules which are slow releasing. Retinoic acid has been proven to stop relapse by about 10%. Next Monday Abbie is admitted to the Marsden again for the second MIBG/Topotecan. We are expecting this to knock her more than the first dose. Abbie is scheduled to have her stem cells re introduced on 2nd February to assist her recovery. Mike and me are very pleased that Abbie is in virtual remission. It would be nice to get confirmation from the Marsden that this is the case. We are however aware that there is a very strong chance of further relapse and realistically the odds are stacked against her. Abbie recently won a Xmas calendar drawing competition held by by the David Adams Leukaemia Trust and was presented with her prize by Gemma Hunt from CBBC (see picture below). The Marsden have now asked permission to use Abbie's drawing for one of their own 2006 range of Xmas cards. Naturally Abbie is very pleased with herself!! Unbelievably It has been 3 months since our last update. Abbie tolerated the MIBG treatment pretty well - the worst side effect was a low platelet count for a few weeks. A week last Thursday Abbie had a MIBG scan. Mike and me were pretty shocked to see that there was 3 spots of disease evident on the scan. Two on her left knee and groin and a further new one on her left shoulder. The following Tuesday we were given the news that there was also faint uptake in the right arm and leg. We have been told that there are no curative options available at this stage. Mike and me are hoping that the Marsden will give radiotherapy on the three spots we saw on the scan and that the Cis retinoic acid that Abbie is currently taking deals with the other disease. We will probably also consider a maintenance drug in the hope that this will prevent the spread of disease without making Abbie too poorly. Realistically we have done absolutely everything humanly possibly do to fight this disease and yet it still keeps coming back. I have a meeting with Abbie's consultant on Thursday to discover what palliative options are now available and of course we pray for a miracle. In herself Abbie is really well. She went back to school last week and has managed three full days. Her leg is improving all the time as the bone gets stronger. Abbie and Jamie are blissfully unaware about what is going on which is how we would like to keep things. For that reason if you do call it would be preferable to ring after 9pm when they are both in bed. Since April Abbie has been taking cis-Retinoic acid (the acne treatment). The side effects have been pretty grim with Abbie feeling really depressed and having very dry skin around her face and lips. In the middle of May we decided to book a holiday to Spain for the half term and typically a couple of days later Abbie came down with a temperature and once again went on IV antibiotics. Luckily we only had to stay in the Royal Surrey for one night and her treatment finished the day we flew out. She also began to complain of pain in her leg but we realised on holiday this was due to the plastic support caste she was wearing which was rubbing on her leg. Amazingly during our holiday she was the best we had seen her for ages running up and down the beach, experiencing no pain, walking normally and eating really well. 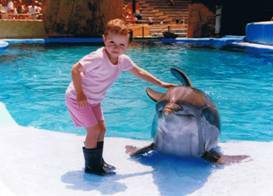 Abbie loved the dolphin show we took her to see, (see below). The day after we got back she started her third round of cis-Retinoic acid and within two days began limping again and complaining of pain in her ankle. We were convinced that this was due to the side effects of the cis-Retinoic acid. She was seen at the Royal Surrey by her physio who suggested a leg X ray. This showed that the bones in her ankle and knee were in better condition than the X rays last taken in April. However her reflexes showed a poor response and a day later I was contacted by Abbie's consultant at the Royal Surrey who wanted to see her immediately as he was concerned that there may be a tumour compressing her spinal cord. She needed an emergency MRI scan as a tumour on the spine needs to be dealt with immediately. Fortunately there was no tumour on the spine but on Tuesday Abbie's consultant at the Marsden told me that the MRI scan clearly showed a tumour on her pelvis. Today Mike and myself took her to the Marsden were it has been confirmed that there is a 6cm tumour on her left hip which may be indirectly causing the pain she is experiencing in her ankle. They also believe she may have bone marrow disease but do not think that it is too bad yet. In terms of treatment we have been offered radiotherapy to the hip which should take place next week and she will also probably be put on a maintenance drug to keep her disease at bay for as long as possible. We have also asked whether she could have two rounds of Topotecan the chemo drug she had throughout last year as this was very effective but the feeling is that this will not be of any great benefit to Abbie at this stage. In herself Abbie is fine. Now she is off cis-Retinoic acid she is no longer depressed and as long as we manage her pain relief she is happy and attending school be it only for a few hours now each day. The last few days she has also been sleeping in the afternoons. 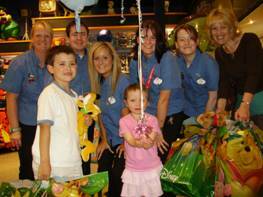 We recently arranged for Abbie to have her "wish" granted by the Make a Wish Foundation. She has asked to be a princess for the day and to ride a pony. 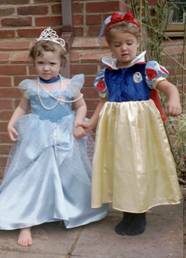 Last Saturday she was taken shopping to the Disney Store in Guildford in a pink stretch limo to choose her princess outfits and Jamie and herself were given free run of the shop to choose anything they wanted. 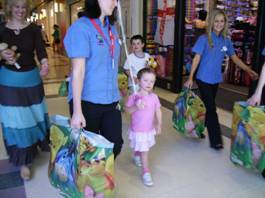 The Disney staff then carried her shopping back to her limo. 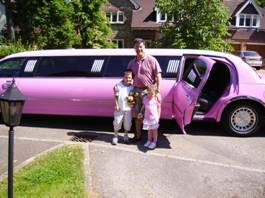 This Sunday her pink stretch limo will collect us and take us all to the Nutfield Priory which is a country mansion fit for a Princess where she will be shown to her suite. She will have a special Princess menu for lunch and in the evening her butler will serve dinner to her. On Monday morning we will be collected and taken to Bookham where Abbie will ride Cathy her princess pony. The following Sunday Abbie and Jamie are guests of the Queen at her 80th birthday party at Buckingham Palace. The past six weeks has been an emotional roller coaster with a continual wave of ups and downs. Abbie really enjoyed her 'Make a Wish' back in June at Nutfield Priory. She came down with a temperature for a few hours on the Sunday at the hotel but was well again in the evening when the butler served her princess menu. She started radiotherapy to her hip her on the Monday and became quite unwell and stopped walking again. The radiotherapy was completed on the Friday and Abbie and Jamie attended the Queens birthday party on the Sunday with Mike, Aunty Susie and myself. The following week Abbie started palliative oral chemotherapy. She takes Etoposide and Cyclophosphamide for three days every week for three weeks and then has a week off. Fortunately Abbie has always responded well to chemo and a few days after starting the chemo became well again and began to walk again. The side effects seem pretty minimal and the blood transfusions have become less frequent - sometimes the gap is up to two weeks but Abbie does seem to need platelets weekly. In the first week of July Abbie was involved in two school concerts and sports day where she won a race in a high speed buggy. The second and third week in July Abbie was on great form and we completely weaned her off morphine and Calpol. We went on holiday to Hastings for a week which she seemed to really enjoy and went swimming daily. The following week she managed three days in school holiday club with Jamie. Unfortunately the oral chemo has caused her hair to fall out again which was a bit of a surprise to us all. Abbie has taken it very well and blames it on the hot weather. Last night the hair fairy came and gave her a princess alarm clock. The oral chemo therapy cycle stopped for a week and after seeing Abbie's consultant at the Marsden we decided to delay chemo for a second further week as Abbie was neutropenic and her blood counts needed to recover. We were also going on holiday to the New Forest with all her cousins. The delay to the chemo meant Abbie became very poorly again very quickly - all the signs of neuroblastoma came back very quickly - temperatures, night sweats, vomiting, excessive sleeping, pain and general misery. 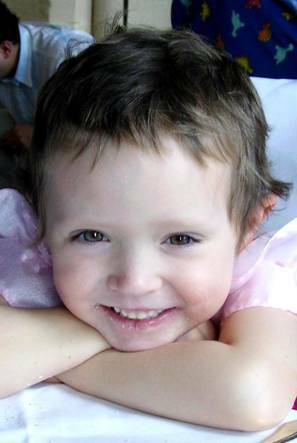 She also developed a dark circle around her right eye which is a neuroblastoma sign. Very quickly we had to put her back on morphine and on Tuesday last week I had to take her to the oncology ward at Southampton hospital where she had a platelet transfusion. The following day I was really worried about her. With hindsight I now realise she was morphine'd up to the eyeballs as I had just started her on higher dose slow release morphine, but I really thought at that point she only had a few days left. I managed to wake her and took her home on Wednesday morning. Thankfully her blood counts had recovered enough for her to start back on the oral chemotherapy. Again it has worked miracles. Four days later and we are now gradually reducing her morphine again, she is awake most of the day, has started eating again (although only small morsels of food - which is an improvement on no food at all), and is enjoying life again. Considering she has not eaten anything much for about four weeks she is not as skinny as you might think. I blame this on the slow metabolic rates of her parents! Hopefully Abbie will be well enough to have a further holiday this summer but we are waiting to see how she is before making any commitments. Again this month has been full of highs and lows which has followed a pattern of Abbie taking oral chemotherapy. Just three weeks ago she was the best we had seen her for sometime. She went to a party, ran around, played games and went for a swim. Two weeks ago we took Jamie and Abbie to Sandbanks in Poole where she was well and spent 2 hours on Tuesday evening at the disco - dancing and playing games. We came home on Wednesday evening and took her to the Marsden on Thursday. Her consultant examined her and found a large new mass in her thorax and a number of lesions on her skull. Her left eye has also been affected by a lesion and she has lost 2kg in weight. Her consultant was quite shocked by the deterioration in Abbie. She told Mike and myself to expect the worst as a bleed caused by low platelets or tumour could cause a coma at anytime. We have also been given a box of IV drugs for emergency as we have decided to keep her at home rather than to go to a hospital or hospice. Abbie is very ill now. She has been robbed of everything life has to offer. She is tearful and in pain and sleeps much of the time. This morning we discovered a tumour in her mouth has caused an adult tooth to push out at a right angle. We have also realised in the last day or so that she is severely depressed. We do get occasional smiles when we talk about happier times in her life. It is very painful seeing her so distressed and in so much misery but we know that she will not have to endure the pain for much longer. Jamie is now aware that Abbie will die shortly and now is probably the most appropriate time to tell your own children that Abbie will die soon. Hopefully you will be breaking the news more gently than by telling them after her death. Jamie has been amazingly accepting of this news but will not discuss it any further. Abbie has not been told that she is dying and we would rather she remained unaware. Our beautiful daughter Abbie died at 7.36 am this morning. After a fairly restless night she began to experience intense pain in her leg at 5.30am this morning. I managed to give her a dose of oral morphine and at around 6.00am I climbed into bed with her and was comforting her. At around 6.45am she began to fit and I was able to cuddle, comfort and reassure her. This was the first time in a while that I had been able to cuddle her as she had been in too much discomfort. Mike took over while I had a bath, then Jamie who was getting ready for school went to her room to say goodbye and she just died. We are truly devastated that we have lost our child but pleased she is no longer suffering. It is a real comfort to know that only five weeks ago she was playing, running and swimming at a party and this time four weeks ago spent 2 hours disco dancing. Last Monday she made flower shaped biscuits, on Wednesday made a supermarket till out of boxes and collected Jamie from school and Thursday painted egg cups. On Saturday morning we took her for a walk in her buggy to the local shops and she insisted on renewing her library book. We have arranged Abbie's funeral on Friday at 2pm at St Martins Church, Ockham Road South, East Horsley. The funeral service will be child friendly. We are requesting that children wear their school uniform and bring a flower (unwrapped) from their garden. These will be collected and scattered on Abbie's casket when she is buried. We also request family flowers only but donations may be made to Abbie's Fund which will shortly be becoming a registered charity. Adults may wear some pink if possible. We do not want Abbie's funeral to be too sombre - as Mike says he wants Abbie to look down and wish she was there. Immediately after the service Abbie is having a private woodland burial in a natural burial ground with only immediate family. The concept of a natural burial is to return the body back to nature. The site will be marked by a tree and bluebells.